Lyft drivers at Disney World Resorts in Florida can be included in a union contract formed before their jobs even existed, according to a ruling by the National Labor Relations Board. Last year, Disney (DIS) and Lyft partnered on a ride service for resort guests. Rather than take buses to the amusement park, guests could use the Lyft app to summon a "Minnie Van" for $20. The 60 or so drivers of the vans are Disney employees. The ruling means that the drivers can can be covered by a contract formed by the Teamsters and five other unions called the Service Trade Council Union in 2014. Disney had opposed the inclusion of the Lyft drivers, according to the ruling, because the original, five-year contract waived the right to include any workers not mentioned at the time of its forming. But the Teamsters had argued that the Lyft drivers were basically doing the same job as the other workers included in the Service Trade Council Union, according to the ruling. The drivers are known as "ride service associates." Disney and the Teamsters Local 385 did not answer messages from CNNMoney seeking comment. The drivers of the polka-dotted "Minnie Vans" are expected to interact with guests and entertain them, "impart information about the employer's attractions," and help them resolve complaints. 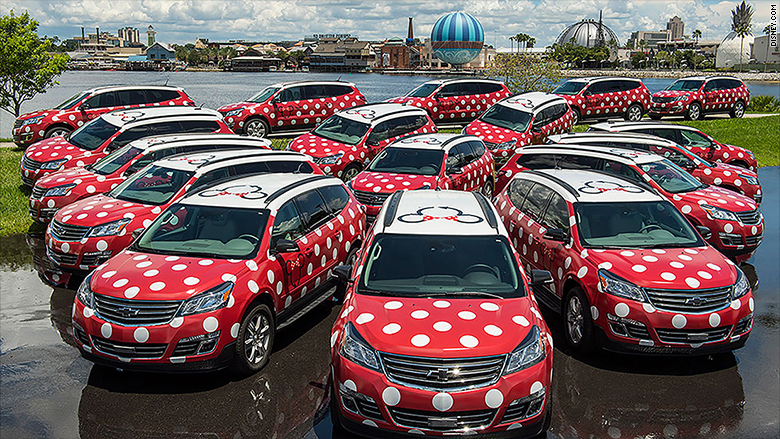 The "Minnie Van" drivers represent a miniscule fraction of the 77,000 workers employed by Disney Resorts. That number includes 38,000 workers represented by the Service Trade Council Union. They're paid from $13 to $21 per hour, according to the ruling. The NLRB's Disney ruling does not affect a larger issue concerning Lyft and Uber drivers, who are considered contractors without the benefits afforded to employees. A ruling issued in California earlier this month will make it more difficult for employers there to treat workers as independent contractors without employee rights like minimum wage, overtime, worker's compensation, unemployment insurance and paid sick leave.